New experiences in Howard L. Hawks Hall continue to afford business students learning opportunities that maximize educational opportunities. Recently, Brandon Urry, assistant director for specialist programs, welcomed Bo Hanson to speak in his Managerial Skills Seminar class. 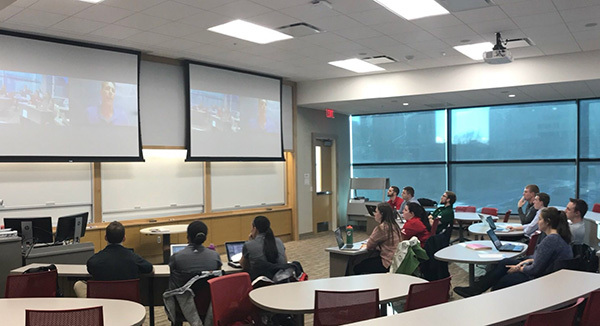 Hanson, located in Australia, works in athletic assessment, and visited with students in the masters of arts in business with a specialization in intercollegiate athletic administration program via two-way videoconference technology. David Hartline, director of information and technology and facilities operation, helped lead efforts at the University of Nebraska–Lincoln College of Business to integrate classrooms with distance technology. His team equipped the classrooms with the hardware and software necessary to engage students globally. All classrooms in the new facility contain videoconference and lecture capture technology. The new capabilities allow for expanded pedagogy and learning outcomes regardless of subject matter. To learn more about classroom technology, contact Lance Schendt, classroom specialist, or visit the IT Services and Facilities Operation webpage at http://business.unl.edu/it-services/.